Sam wanted to adopt a kitten, so she went to an adoption event at the local pet store. There she found two kittens which had been sharing a cage together, and they had been named Shrimp and Grits. (Shrimp and grits is a popular dish found in many fine Southern restaurants.) 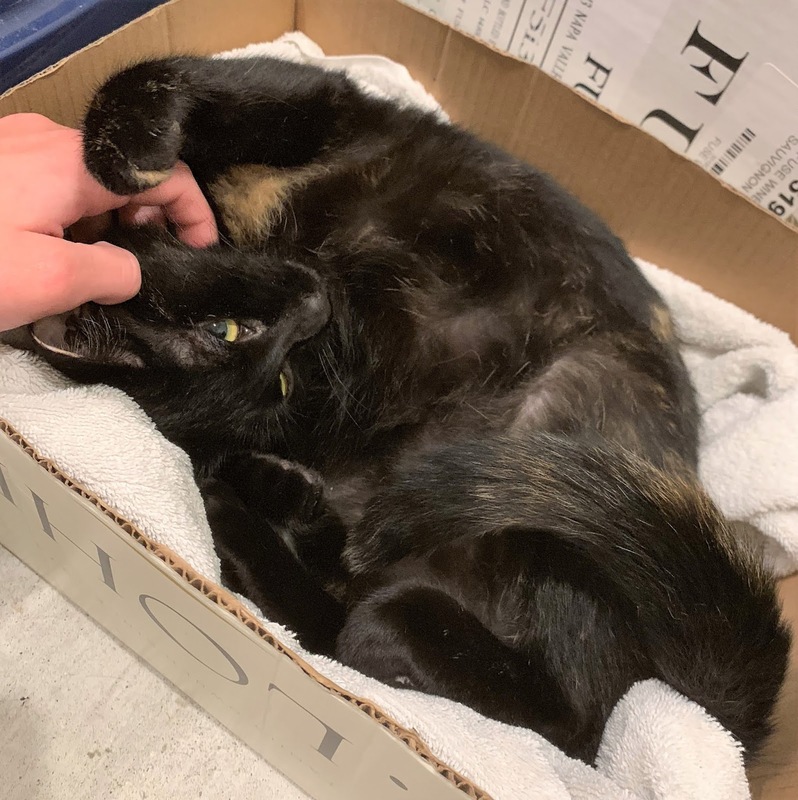 Grits, a mostly black tortie, came straight up to Sam, jumped into her lap and started purring. It was love at first sight for both of them, and in that moment, the bond had formed and the decision to adopt had been made. Today, Grits is one and a half years old, and the bond she shares with Sam is still just as strong. So when Grits went missing a few days ago, Sam was very worried. Sam looked all over and called for Grits but could not find her. The next day, a neighbor reported on nextdoor.com that there was a cat stuck in a tree in his backyard. Sam went to look, and there was her sweet Grits high up in a tree. Sam was relieved to have found her, but now had a new problem in getting her down. By the end of the day, however, the Nextdoor post had managed to connect us together, and we agreed to meet first thing in the morning to rescue Grits. 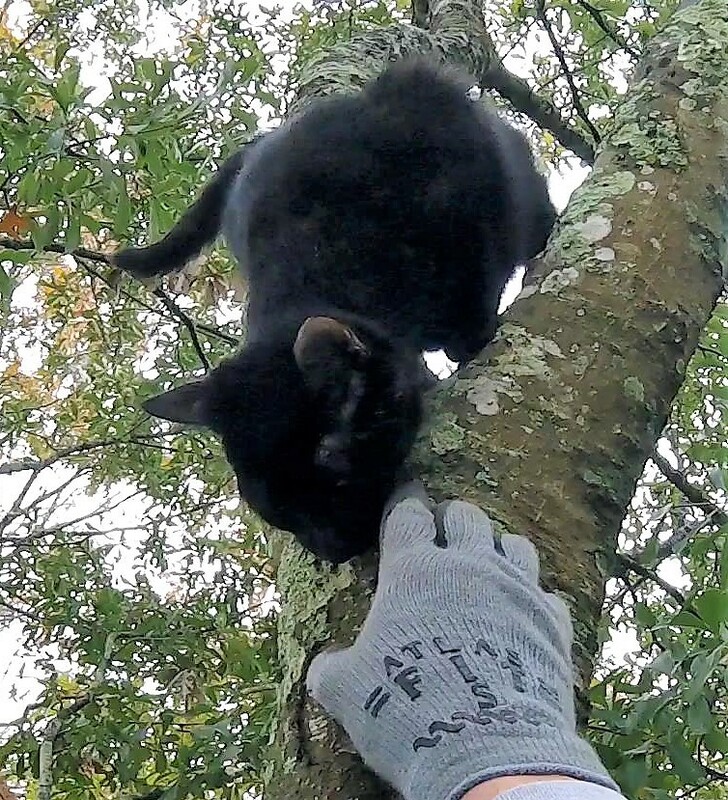 The next morning, after Grits' third night in the tree, I arrived to meet Sam, her sister, Addie, and their mother, Dianne, in their neighbor's backyard. 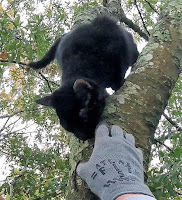 Since the tree that Grits was in was on the fence line between two neighbors, Sam had already obtained permission from both neighbors to allow me on their property and to climb the tree. 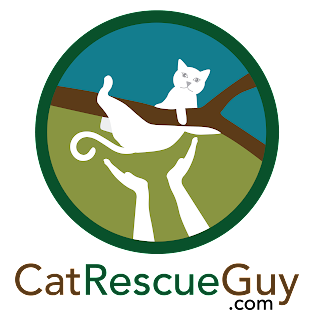 I am always so very grateful to cooperative neighbors for allowing me into their yards and making the rescue possible even though the cat is not theirs. 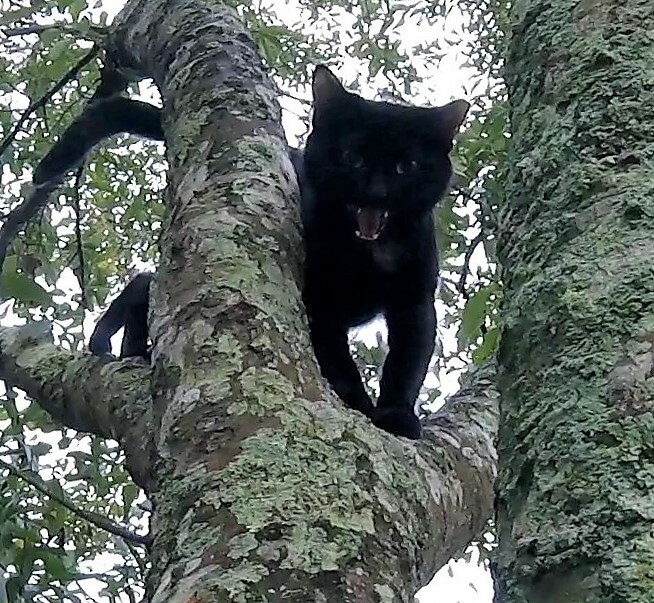 Grits was about 40 feet high in an oak tree that was about 60 feet tall. 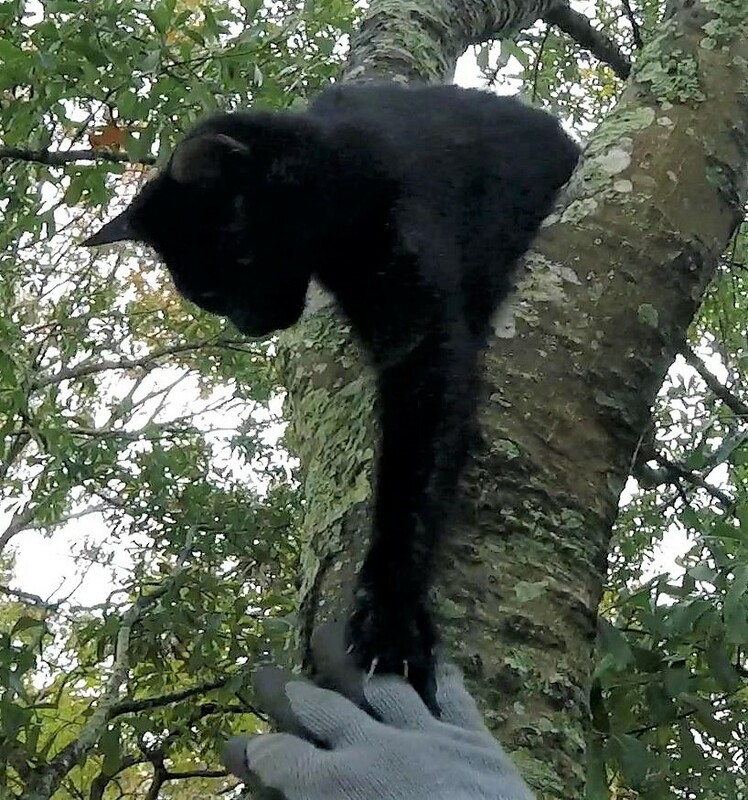 There were no suitable limbs above her to use to anchor my climbing rope, so I installed the rope on a limb below her and worked my way up to her. Grits had been crying out to us almost constantly and continued to do so as I climbed up to her. 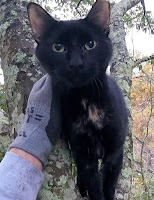 Sam had told me that Grits is a friendly girl, even with strangers, so I was hoping she would be friendly to me in the tree. As I approached Grits, she continued to talk to me, but I could see a small speck of doubt in her face. 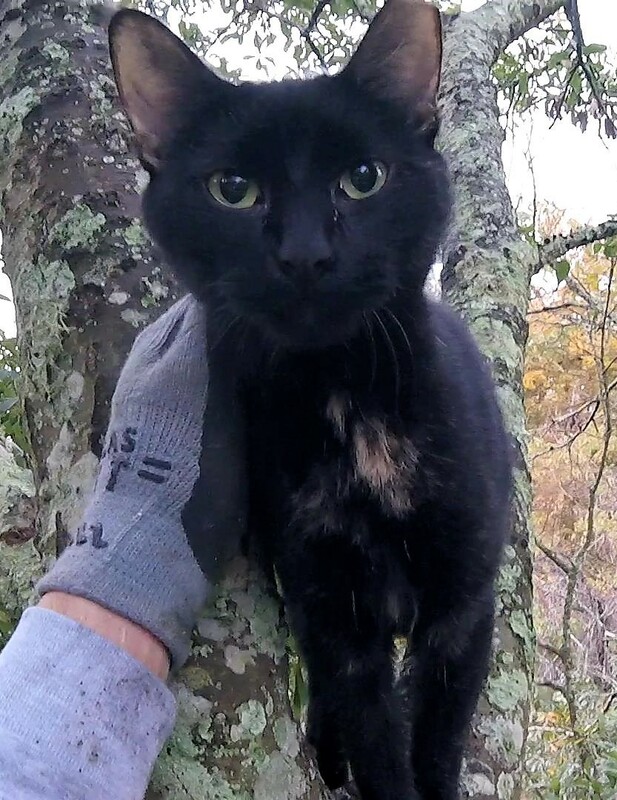 She turned around at one point and began to walk out on her limb, but she didn't go very far or stay out there very long. She turned around and came back to me for a sniff of my outstretched hand and seemed satisfied with that. I pulled myself up a little higher until I was level with her, and she waited patiently for me to do so. Again, she sniffed my hand and then let me pet her. She enjoyed the petting, and I enjoyed giving it to her as we spent several minutes there solidifying our new friendship. I gave her a chance to walk into the carrier, but she didn't seem interested in that. I put the carrier away and prepared the cat bag on my arm. By now, she was even more relaxed with me and showed some interest in getting into my lap. I put my lap in a better position for her, and, indeed, she stepped down onto it. I love it when a cat trusts me enough to get on my lap, but then I also feel that much more guilty for betraying them when I put them in the bag. That was the case here with Grits. She was so sweet and trusting and did not fuss as I grabbed her by the scruff and pulled the bag over her. I brought her down to some very relieved and happy people. Sam held Grits in her arms and then let her poke her head out of the bag. Sam and her sister and mother were very grateful to me for bringing Grits down, and they spent several minutes there enjoying the moment. 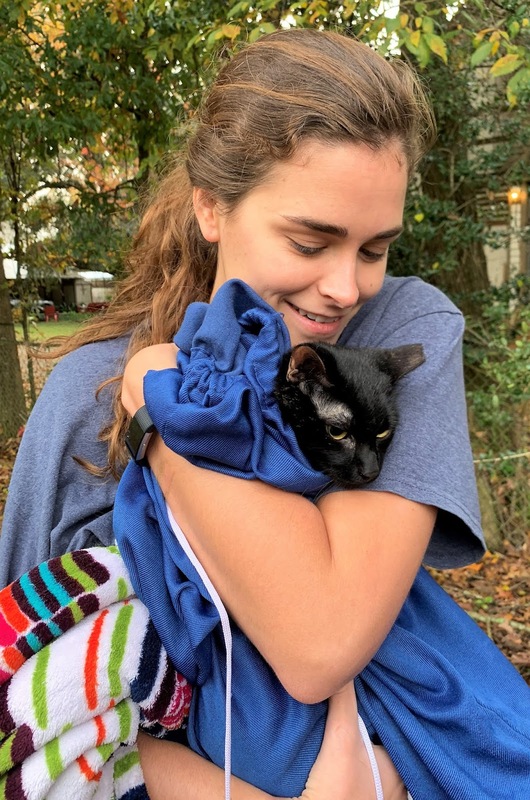 Normally, I don't like to let a cat out of the bag while still outside, but Grits was very calm and knew she was safe in Sam's arms. Since there appeared to be no risk of Grits climbing a tree again, Sam pulled Grits completely out of the bag and held her as they all continued to happily reconnect. After a few more pictures and several "thank you"s, they took her home. A happy reunion is the best part of the rescue to me, yet I often don't get to see it because I usually tell the owner to take the cat inside before releasing it. I am very grateful that I could see this reunion, and I enjoyed every minute of it.